How about an easy chicken recipe on your bridal shower menu? Most people like chicken. There are a variety of ways it can be prepared. There are hot dishes for sit-down meals, and cold for salads and sandwiches. Used in appetizers, it could be mini cold tea sandwiches or hot mini quiches. Food is often one of the bigger expenses of the party. A poultry dish is usually gentle on the budget. Depending on your bridal shower plans, it can be plain or fancy. The following are two dishes that would be great for a sit-down luncheon or a buffet meal. They both are relatively simple to make, and don't require hours of preparation. This bridal shower recipe makes a great presentation for 4 people. Adjust to the amount needed. Pound breasts till thin (about1/4"). Place one slice of ham and cheese, on each breast. Roll up. Coat breast with mayonnaise, then roll in breadcrumbs. Melt butter in skillet and brown chicken breasts, evenly. Sauce: mix soups together, straight from the can. Do not dilute. Heat slowly. Serve over chicken. This serves 4. Adjust as needed. 4 boneless, skinless, chicken breasts or cutlets. Dip breasts in egg, and then coat with bread crumbs. Melt butter in skillet. Brown pieces evenly. Mix sauce with creamer until a medium pink color. Put sauce in the bottom of a baking dish. Place chicken on sauce. Put slice of Mozzarella on each piece. Add more sauce. Sprinkle with Parmesan. If you are doing the cooking, prepares these dishes ahead of time. Then the day of the bridal shower, you can heat them, and relax. 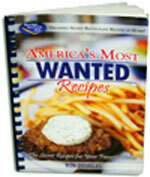 • Go from easy chicken recipe, to food ideas. 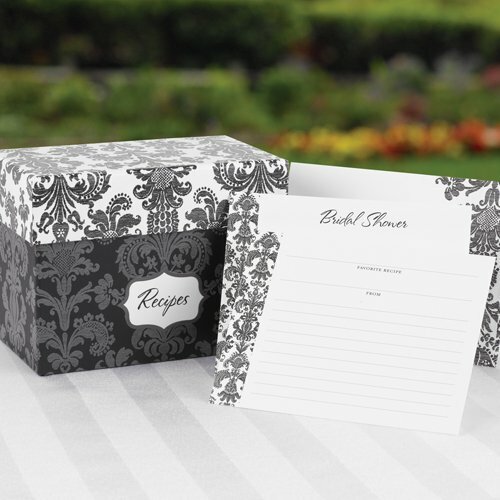 Bridal shower invitation set with Damask recipe box.